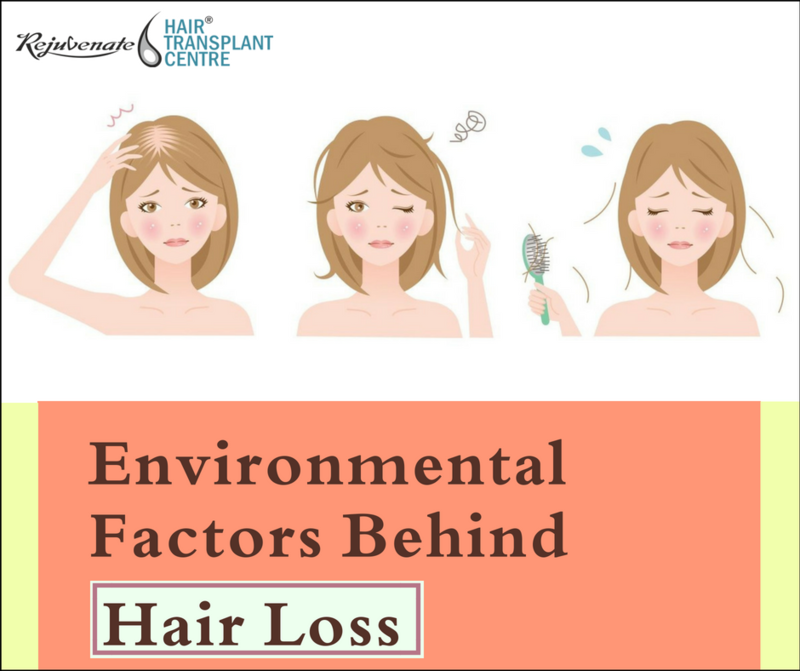 Do Environmental Factors Behind Hair Loss? Today pollution is on the rise all over the world. Those people who have un-patterned hair loss are affected due to the exposure to the pollution, chemical and many other factors. Many people are living in an urban environment and the downside of living in those areas that the person have to be regular in touch with dust, smoke, grime and pollution which causes serious health issues. Skin and hair are one of the first parts of our body which really get exposed to pollution. To protect our skin we have many protective creams and lotions but there is only little mirror option left to protect hair from battling. When any diseases happen in our body it also covered our hair. Day by day due to pollution everyone is inhaling bad air. This poor quality of air not only affects our respiratory system and nervous system but also affect our scalps which causes itching and dandruff. Some studies also show that prolonged exposure to pollution can even aggravate hair loss. Any kind of environment pollution contributes scalp irritation, redness, itching, dandruff, excessive sebum secretion, and hair loss. Nowadays many people don’t realize that environment also plays an important factor that can potentially lead to hair loss. Hard Water Effect on Hair Hard water is one of the most known environmental factors that causes dandruff and destroy hair follicles because it mainly contains a high amount of silica, magnesium and calcium. Chemical Substances Everyone loves swimming, but there is some consequence on it also (Effect of Swimming Pool Chlorine on Hair ). In swimming pool, many chemicals such as chlorine are added to it to clean the water. This chemical is responsible for damaging the hair. It makes your hair dry and rough. Air Pollution and Smoke When our hair has interacted with contaminated air then the risk of hair loss increases. Many researchers found that when polluted air enters the bloodstream, body and skin it makes hair weaker and thinner. This is also one of the known reasons where people are facing baldness. And yes, there also numerous studies show that cigarette smoking air affects that person who is non-smokers. Heat and Sun Exposure As we know that sun is good for a healthy hair and skin because it provides vitamin D in our body. But we also need to be aware of the unknown danger of sun which can affect our hair. In some studies, it shows that prolonged exposure to the sun may your hair dry and brittle which causes split ends. Need hair wash frequently Daily using natural shampoo is the only way to get rid of any dirt or pollutants that may have accumulated in your hair. It not only cleans your scalp but also avoid the bacterial build up. Always remember that an unclean head may cause dandruff, itching or hair fall. For the best results, you can also use an anti-pollution shampoo that will deep cleanse the hair. Don’t forget to do a massage Healthy hair starts from the roots, so don’t neglect a message while using shampoo or oil in your scalp. This will not only promote the blood circulation but also unclog the pores of hair follicles. It also primarily reduces stress. Cover Your Hair When you plan to go out into the sun then you can cover your hair by wearing cap, scarf or by using an umbrella. Just like your face your hair also requires sun protection. It mostly shows that the outer cuticles of the hair are prone to extensive sun damage and this is one of the main causes of dullness and dryness. Avoid excessive chemical treatments Try not to repeatedly undergo chemical treatments, such as perms, dyes and bleaching, as this will weaken your hair and cause it to be even more susceptible to damage from air pollution. Do not step out with oily or wet hair as these attract dust and dirt particles which will stick to your hair. Take a deep conditioning hair spa once a week to prevent dryness, strengthen hair strands and fill up with extra nutrients which make hair healthy. Increase your protein intake by adding fish, leafy vegetables, nuts, yoghurt and fresh fruits in your healthy hair diet. Apply a homemade hair mask made from natural ingredients such as honey, yoghurt, strawberry and vinegar. Leave on for half an hour then wash off with lukewarm water.